PRA offers Wellness Reimbursement for employees, reimbursing 50 percent of wellness-related purchases up to $500 per year, with a maximum annual reimbursement of $250. Wellness-related expenses can range from sneakers to gym memberships to dance classes! Each January at PRA is Whole Health Month, where different aspects of health and wellness are promoted through guest speakers, blogs, and information sharing. This year’s Whole Health Month activities included seminars on mindfulness and meditation, desk yoga, gut health, and healthy sleep. To encourage employees to use their daily strategic renewal and to increase their physical wellness, PRA instated a company bike share where employees can sign out one of two bikes to ride on the Albany County Rail Trail or to run errands around town. For the past year, PRA has served as a drop-off site for Field Goods, allowing staff to receive a weekly delivery of local produce during their workday. Field Goods provides fresh produce from local farms and includes healthy recipes with each weekly delivery! PRA’s community garden is designed to allow employees to eat healthy on the go! The garden club plants fruits and vegetables, such as mesclun, strawberries, peas, and cucumbers that are easy to grab and add to a lunchtime salad. PRA recently made a healthy transition with its vending machine! We’ve installed a new vending machine from Healthy Me Living filled with healthier snack options, such as nuts, pita chips, popcorn, and more! It’s been a big hit! PRA’s WellStaff Committee guides PRA’s efforts to promote employee wellness. The committee is composed of staff members from all project areas and is responsible for maintain the wellness page on the Intranet, creating a quarterly Wellness board, and organizing wellness-related activities in the office! Bi-annually, PRA hosts an onsite First Aid/CPR/AED class for all employees who are interested in being certified. This class has a strong showing, with roughly 10 employees getting certified (or recertified) each session. To encourage staff to integrate physical fitness into their day, there is a shower available for use at PRA for those who may want to walk or bike to work or participate in a physical activity before work or during their strategic renewal. These steps (and many more) are active parts of PRA’s wellness culture. We are proud to be among “an elite group of awardees” who are committed to providing physical activity and wellness activities to their employees! 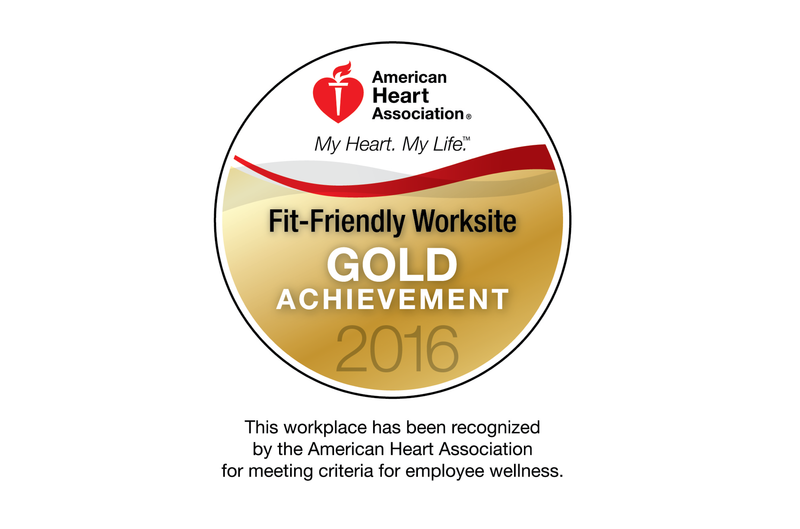 You can find the full list of American Heart Association Fit-Friendly awardees here.